The official insignia for SpaceX's first NASA-contracted resupply mission to the International Space Station, CRS-1. The first of NASA's contracted cargo resupply flights to the International Space Station now has its own mission patch, courtesy of the company launching the spacecraft. Space Exploration Technologies, or SpaceX, revealed its insignia for the launch of its second Dragon capsule to the space station today (Oct. 4). The gumdrop-shape cargo craft is scheduled to liftoff atop SpaceX's Falcon 9 rocket on Sunday (Oct. 7) at 8:35 p.m. EDT (0035 Monday GMT) from Complex 40 at the Cape Canaveral Air Force Station in Florida. The flight, referred to as Commercial Resupply Services-1 (CRS-1), is the first of a dozen resupply flights for which NASA is paying SpaceX $1.6 billion to fly. The mission follows a demonstration flight in May that made history as the first commercial spacecraft to berth with the station. The CRS-1 mission patch, which borrows its shape from the Dragon capsule, shows the solar-powered spacecraft grappled by the space station's Canadarm2 robotic arm as it is being brought in to connect with the orbiting outpost's Harmony module. Below the Dragon capsule on the patch is the Earth. 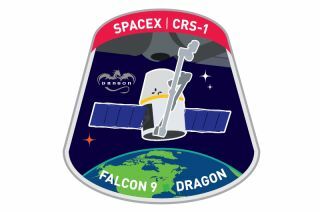 Based on pre-launch photos, the CRS-1 emblem does not appear on the Falcon 9 rocket or the Dragon capsule, but embroidered versions of the patch may fly to the space station and back as part of the mission's Official Flight Kit (OFK) of mementos to be presented to NASA and SpaceX team members for a job well done. The OFK comprises only 17.6 pounds (8 kilograms) of the 882 pounds (400 kg) of hardware and supplies that the CRS-1 Dragon will deliver to the orbiting lab. Included in the pressurized cargo are food rations, crew clothing and more than 160 science experiments for NASA, the European Space Agency (ESA), and the Japan Aerospace Exploration Agency (JAXA). The CRS-1 mission will span 18 days before returning to a parachute-assisted ocean splashdown. Returning to Earth on the Dragon will be nearly 1,700 pounds (771 kg) of science experiment results, spent hardware and former crew members' spacesuit components. SpaceX is one of two U.S. companies with contracts to provide unmanned resupply flights to the space station for NASA. The other firm, Orbital Sciences Corp., of Virginia, has a $1.9 billion contract for eight missions using its new Antares rocket and Cygnus spacecraft. The first Antares rocket was rolled out to its launch pad at NASA's Wallops Flight Facility on the Virginia coast on Oct. 1. While SpaceX's Dragons are the first unpiloted spacecraft to visit the International Space Station, unmanned cargo ships from other countries continue to make deliveries to the orbiting complex. Russia's Progress spacecraft, ESA's Automated Transfer Vehicles (ATV) and the H-2 Transfer Vehicles (HTV) from JAXA round out the station's robotic resupply fleet.